Nevada County is another small Gold Rush county, created in 1851 along with Sierra and Placer counties to deal with the swarms of 49ers. Nevada County is a bit larger than Sierra County just to the north. Although Nevada is mostly above 3000 foot elevation, it dips farther down the western foothill slops and has extensive oak, chaparral, and grasslands habitats in and around Spenceville Wildlife Area. Grass Valley is the major town, but there is much new development in the Martis Valley (shared with Placer Co.) along Interstate 80, east of the Sierran divide, as travelers rush toward the State of Nevada. Boca Reservoir and other lakes in the east provide waterfowl habitat among sage and open pines. The Donner Party was trapped near Donner Lake; their memorial is also on I-80 within Nevada County. To the west, there are lovely canyons along the Yuba River. 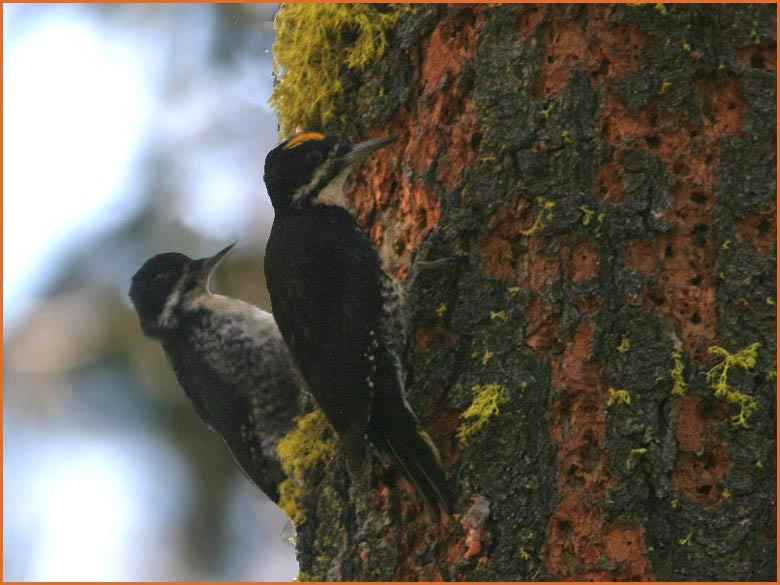 The headline photo is a backlit shot of a lucky find: a male Black-backed Woodpecker accompanied by a fledgling. Rita and I heard the male tapping in the woods, and were very surprised when, upon chasing it down, the sound proved to be the adult working the bark and feeding the grubs found to the baby.